Our goal this year was a modest $1000, but we blasted that out of the park to raise almost $4100 by the time the stream finished! We could not have achieved that goal within a week and a half without the help of our generous community, and those with the desire to see Clive in a princess dress! And thank you to everyone who supported our efforts to game and stay up all night! The first shift arrived at the office and got the stream live on Twitch without too much technical difficulties, thanks to last year's experience and staying late to set up the night before. 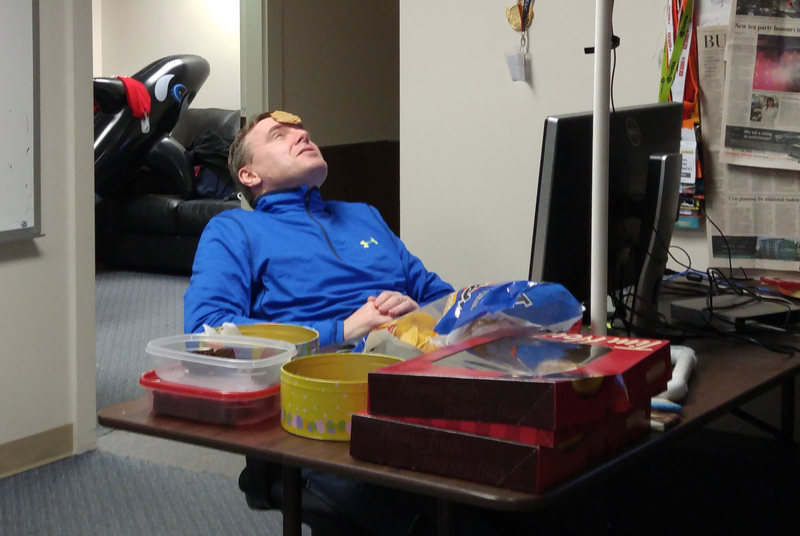 Plus, there were piles of sugary treats to snack on for focus. Cory led the charge, with his ambitious playing of an Idiot Savant build in Fallout 4 while the rest of the day crew trickled in to start their gaming. We were joined briefly by Kyle from Indochino, who played Ghost Blitz and Anomia with some of us. 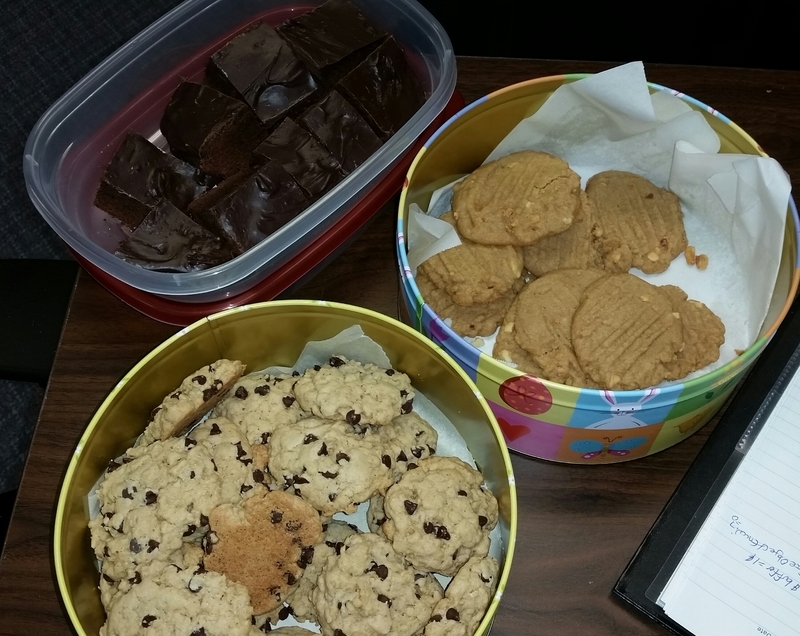 Brownies, peanut butter cookies and chocolate chip cookies were just some of the treats available to snack on. The cookies were all gone by the end of stream. Letting Justin leave the stream command so he could go play the "Get Me Out of Here" objective in Crusaders, Eric manned the chat room and played Meta Game with those in chat and asking those in the office their opinions as well. It's always interesting to talk about what games we have in common and what we think about them. 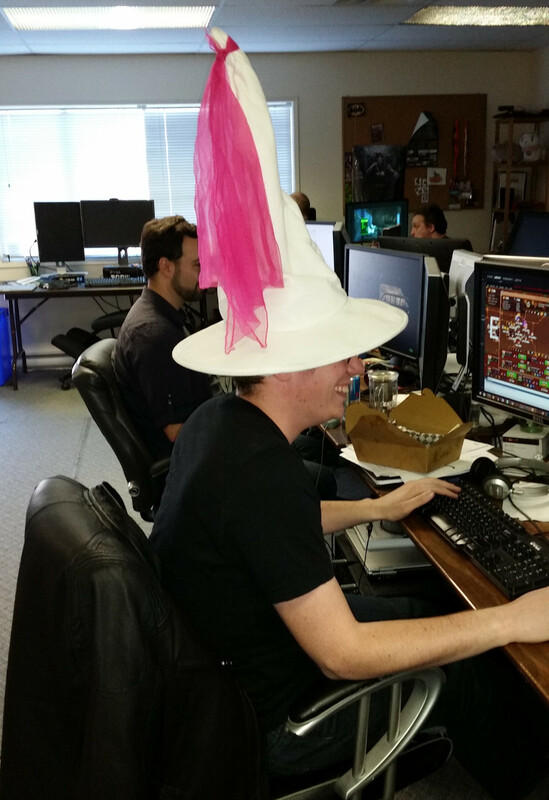 Justin wearing Clive's alternate princess hat choice, thanks to Erika's silliness, while he beats "Get Me Out of Here" and eats lunch with Dave playing Fallout 4 beside him. We were joined later in the day by a bevy of teenagers, who helped keep us awake all night, and Princess Clive. 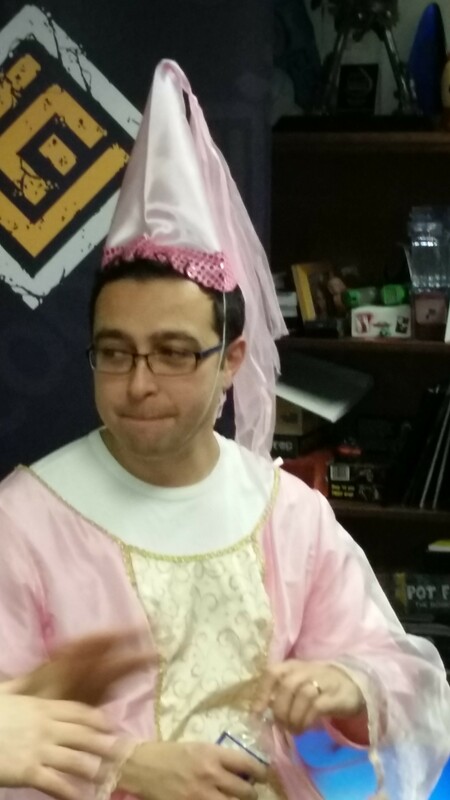 Clive really was a good sport about following up on stretch goal and staying in the princess gown all night, even doing some curtsies and waves on camera for the people chatting with us on stream. Andrew took over stream command for part of the evening, and really enjoyed the chance to interact with the players in our community and get to know them better. And he even learned more about himself, like that he is able to get a cookie from his forehead to his mouth by scrunching his face. He also got a donation from doing it, which is awesome! Katherine made her goal while on stream, and followed up on her donation goal bonus as well. She started out by roughing in the headbutting dinosaur poster that her main donator asked for, then moved on to her "derpy doodles" of doing anything suggested by people in our twitch chat. 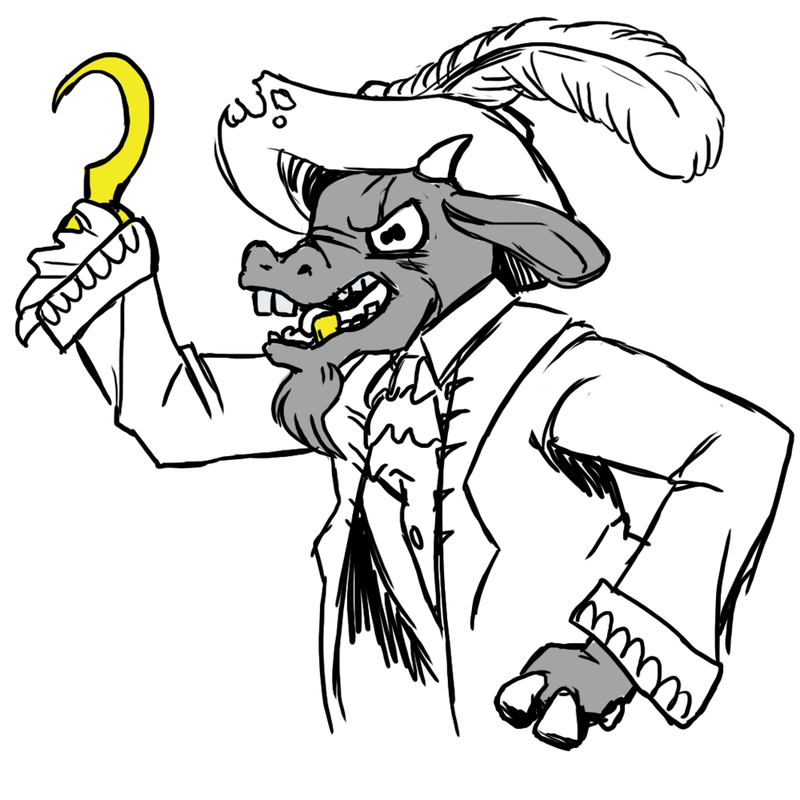 You can check out all her drawings, like the pirate goat or wizard orca, here. Thank you for sharing them and being here for the stream, Katherine! In the wee hours of the night, with the need to resist sleep setting in, the teenagers volunteered to man the twitch chat. 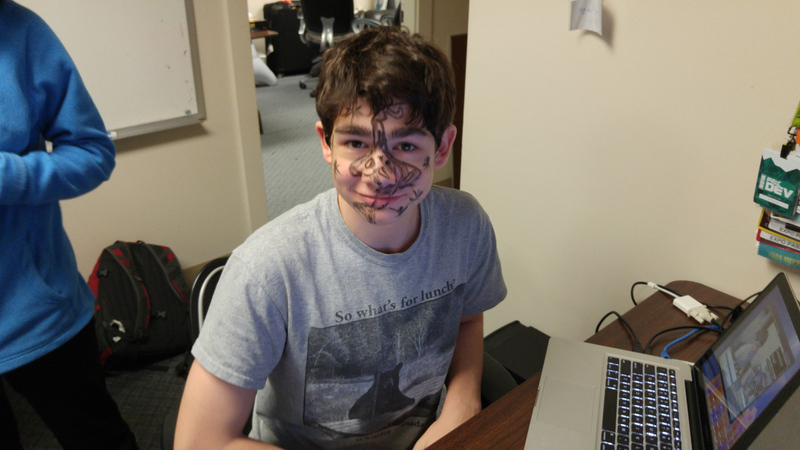 They decided to do whatever anyone in chat asked for, and ended up raising $30 for drawing on each other's faces! Plus, they showed off their exercise skills with push ups and sit ups. The sunrise in the morning brought sleeping teenagers but also the siren call of breakfast. (Next year, we'll make it earlier in the morning, because it helped us wake up!) 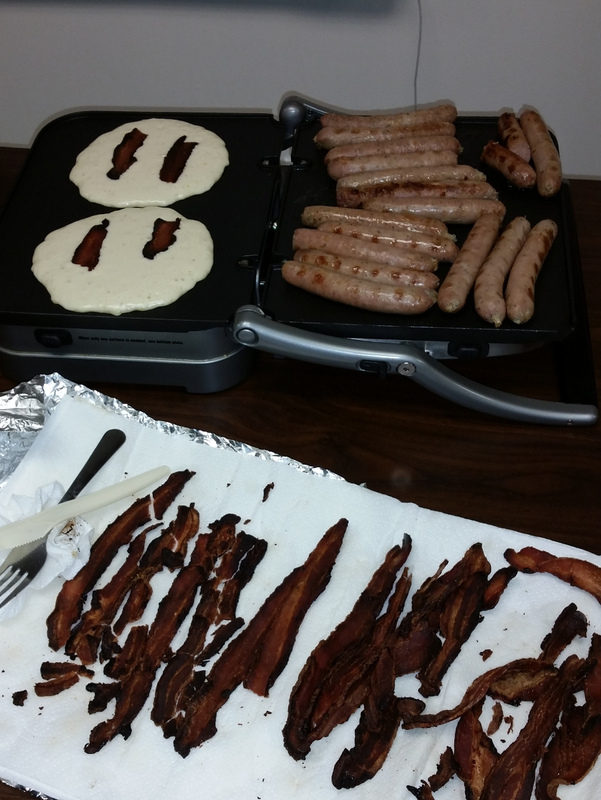 Once Cory had his coffee in him, he whipped up the pancake batter and Erika had charge of cooking the batches of bacon pancakes! We had prevailed through the night! For interested Bush Whacker players: You can still donate if you're interested and be immortalized in our next area expansion. This option remains open until the end of the 2015 calendar, when the 2015 Extra Life drive closes. 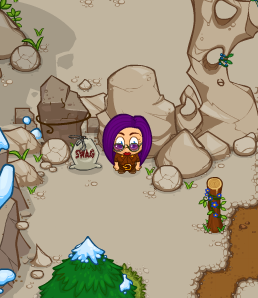 Please comment on Justin's page with how you'd like your character to appear. Thank you for supporting all of us! !